Anchorage of externally bonded reinforcement is the main problem for strengthening concrete structures with CFRP strips. This paper presents the mathematical theory of prestressed CFRP strips anchorage. Results of solution of differential equations describing the elasticity problem of bonded CFRP strip are compared with some tests results. where sp(x) is normal stress in CFRP strip, sc(x) is normal stress in the bottom of a concrete beam , tp(x) is shear stress in direction of axis x in adhesive, ta is thickness of adhesive, tpis thickness of CFRP plate, Ep is Youngâ(tm)s modulus of CFRP plate, Ec is Youngâ(tm)s modulus of concrete, Gais shear modulus of adhesive (N/mm2 ). where M(x) is the bending moment and N(x) is the normal force. Fig 1: Geometry details, distribution of internal forces. where Atr is area of transformed cross section (transformed factor and ), I tr is moment of inertia of the transformed cross section, zctr is the distance of the loaded concrete fibres from to the centroid of the transformed cross section. The constants C1 and C2 are found out by using appropriate boundary conditions. Figure 2a shows the distribution of the normal stresses sp(x), sc(x) and the shear stress tp(x) along the x axis. In this solved example, the influence of anchorage by distance of 35 mm from the end of plate can be neglected. The design details and material characteristics are: a beam 150x150x600 mm, strip SIKA CarboDur S512, Ec=27 Gpa, Ep=155 GPa, Ga=5,33 GPa. The scheme of loading is shown in Figure 1. Figure 2b shows the internal forces (normal force N(x) and bending moment M(x)) in the concrete block along the x-axis. The constants D1, D2 can be determined by using the proper boundary conditions. Fig 2: Results of analytical solution of anchorage problem. a) Stresses distribution along the anchorage zone sp(x), tp(x), sc(x). b) Dependence of internal forces in the concrete specimen on distance x. The distribution of the normal stress s n(x) along the x-axis obtained from analytical solution for the identical example solved before is shown in Figure 3. Fig 3: Stress distribution along the anchorage zone s n(x). Anchorage blocks of dimension 150/150/600 mm were prepared from concrete of class B15-B25 according to the Czech standard ÄSN 73 1201 (1986). The producer and sponsor of the research work were Prefa Brno, Prefa TovaÄov and SIKA CZ. The physical and mechanical properties of concrete specimens (Young modulus, tensile and stress strength) were determined by non-destructive methods before the beginning of the tests. The CFRP strips of cross-sectional dimension 50/1,2 mm and YoungÂ´s modulus 155 GPa was bonded to the prepared surface of different anchorage lengths - 150, 225 to 300 mm (see Figure.3). The aim of the tests was to determine the influence of anchorage length and size of the cross force (acting on the anchorage zone) on the ultimate axis force of the strip. The resistance tension-meters were glued to the strips, the deformation along the length of anchorage was measured with videoextension-meter. Scheme of the anchorage zones and position of the measuring points are shown in Figure 4. Fig 4: The elevation of the anchorage zones of the specimen with strain gauges. 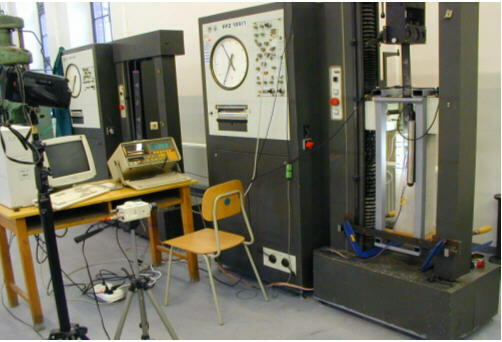 Arrangement of the test (the test set-up and applied apparatus) is shown in Figure 5. Figure 5a represents anchoring without stirrup (without acting cross force on the anchorage area), Figure 5b demonstrates anchoring with stirrup without prestressing and Figure 5c illustrates anchoring with prestressed stirrups. The results of the test with zero cross force acting on the bonded strip (alternative according Figure 5a anchoring without stirrup) of the glued length 150 mm is shown in Figure 6. The actual length of the anchorage is in this case smaller than the necessary anchorage length. With higher length of the anchorage it is possible to achieve higher axial force in the strip. Fig 6: Strain of CFRP strip with anchorage length 150 mm. Comparison of the strip strain between analytical results and experimental tests at small tension normal force of the strip for the bonded length 150 mm is shown in Figure 7. Fig 7: Strain of CFRP strip along the x axis. Fig. 8 shows strain rise of CFRP strip at measuring points throughout whole course loading on the specimens with glued length 225 mm. Fig 8: Strain measured through resistance tension-meter (M1, M2, M3, M4). The comparison of the theoretical and measured results of stress and strain at the anchorage areas demonstrates good accordance at the linear area of behaviour. The theoretically derived design equations can be used for anchorage of non-prestressed and prestressed CFRP strips. This contribution was prepared within the scientific-research work of the Project FAST VUT in Brno, CEZ 322/98 "Theory, Reliability and Damage of Statically and Dynamically Loaded Structures" and Czech grant agency GACR 103/02/0749 "Modern Methods of Strengthening Conrete and Masonry Structures and Optimision of Design". The co-sponsors of described work were Prefa Brno and Tovacov and SIKA CZ.